An employee prepares a burrito bowl at a Chipotle Mexican Grill Inc. restaurant in Louisville, Kentucky, Feb. 2, 2019. Shares of fast-casual food chain Chipotle are headed for their best quarter ever: They're up 60 percent year-to-date and nearly 80 percent since December. Over the last 12 months, shares are up 110 percent. On Tuesday, the stock reached its highest level since 2015. If you invested in the company 10 years ago, that decision would have paid off big time: According to CNBC calculations, a $1,000 investment in 2009 would be worth more than $10,000 as of March 29, 2019, a total return of over 900 percent. In the same time frame, by comparison, the S&P 500 was up 240 percent. 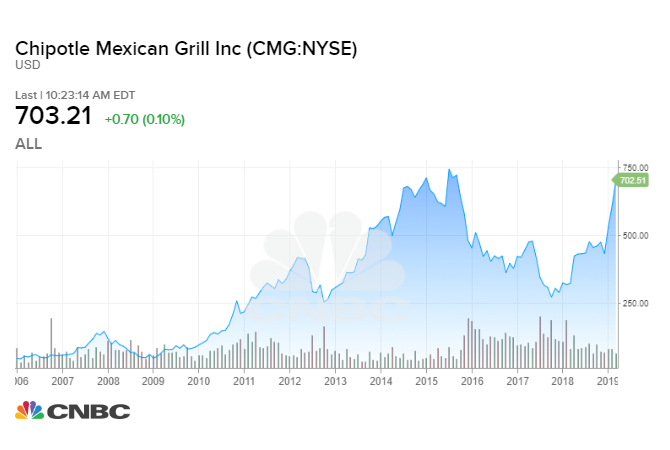 While Chipotle's stock has done well over the years, any individual stock can over- or under-perform and past returns do not predict future results. In this case specifically, some investors remain cautious. Research Analyst Erin Gibbs of S&P Global Market Intelligence said Tuesday that the stock is "a little pricey at this point." Its "valuations are very extended, and ... if they don't beat these really high expectations, if they don't hit every single number, I'm worried about the negative part and [expectations] coming down," she said on CNBC's "Trading Nation." "We already know from last year [that] health concerns, data breach, anything can send this stock plummeting. I'd like to see an entry point closer to about $615." Chipotle's current stock price is currently hovering around $700. Fundamentally, Gibbs added, the company is "red hot," considering its "double-digit profit growth for the next three years, [its plan] to open 150 stores this year," and its mobile ordering, which is "really helping accelerate its revenue growth and profit growth." The "but," however, is the stock's price point. Frank Cappelleri, chief market technician at broker company Instinet, had similar reservations about Chipotle's stock price. Still, he said, the stock "has done nothing wrong except go up. I think it pauses, and we take advantage of that and buy it on weakness." Investment bank and financial services company Baird sees Chipotle gaining momentum with investors throughout 2019: Although the company "may be due for a short-term breather following the robust year-to-date return … we see a path for the shares to outperform over the next 12 months based on potential for the company to show strong operating momentum throughout 2019, which in our opinion, should help to support investor confidence in sizable long-term earnings power scenarios and keep the multiples on near-term estimates elevated." If you're looking to get into investing, expert investors like Warren Buffett and Mark Cuban suggest you start with index funds, which hold every stock in an index, meaning they're automatically diversified and tend to be low-cost. Plus, because they fluctuate with the market, they're typically less risky than picking individual stocks.